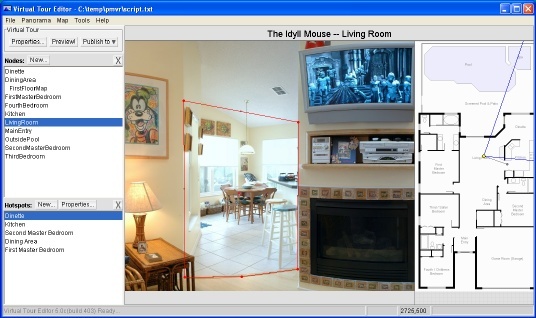 Virtual Tour Editor: The VirtualTourEditor.exe is an easy to use GUI based virtual tour authoring tool included with PMVR. 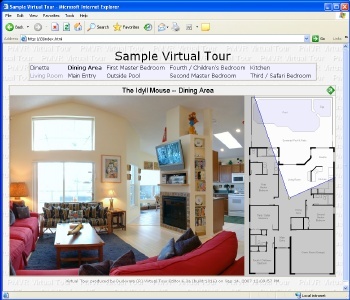 Multi-Platform: Although the VirtualTourEditor itself is a Windows EXE, it produces virtual tours that can be viewed on any platform. Running: After downloading and installing PMVR, run the Virtual Tour Editor via the link on your desktop, or via 'Start / All Programs / PMVR / VirtualTourEditor'. Sample Virtual Tour: In the PMVR download, there is a 'Sample Virtual Tour' folder for a script.txt file that can be opened by the Virtual Tour Editor. Open the script and give the tour editor a try. The basic steps for producing a virtual tour are as follows. Scroll down this web page for more details on each step. Create High Resolution Panoramas: Use stitching software to create high resolution panoramas. Visit www.panohelp.com for help, tips, and articles. Create a New Tour: In the Virtual Tour Editor, go to File / New Virtual Tour, create a new folder in 'My Documents', and name your script file, typically always script.txt. View details. Configure Tour Properties: Decide upon the pixel height of your web tour -- 500 pixels to 1000 pixels high is a good size -- and configure within the tour Properties dialog. View details. New Nodes / Import Panoramas: Click on the "New..." button next to the 'Nodes' button. Each 'node' in the tour is essentially a panorama. Import your high resolution panorama into the tour editor (which will resize the panorama, as needed). Optionally select (or add) an Map image. Repeat for as many panoramas there are in your virtual tour. Add Hot Spots: Add hot spots, which allows and end user to nagivate from panorama to panorama in your tour. View details. Preview the Tour: Preview your tour by clicking on the 'Preview' button. View details. Publish the Tour: Click on the Publish button and select the publish method (trial server, web server, zip file, temp folder, etc). View details. Just enter a nice descriptive folder name for your tour and press OK. The Vitual Tour Editor will then automatically bring up the tour properties dialog (publish tab). After clicking OK, the Virtual Tour Editor will then automatically bring up the New Panorama Node dialog. Select a panorama image for this node. Use the 'Import...' button to import panoramas that you have created (using image stitching software) into the virtual tour project. You typically want a pixel height larger than the viewer window because you want zooming in to initially reveal more detail. The JPEG quality setting is a percentage. We recommend '97 Fine' quality to avoid JPEG jaggies / artifacts. When done, press OK. You high res pano will be resized and saved in the tour folder, images sub folder. Usually maps are added via the 'New Panorama' dialog box by clicking on the "New..." button, but they can also be created (and selected) via the Map menu. 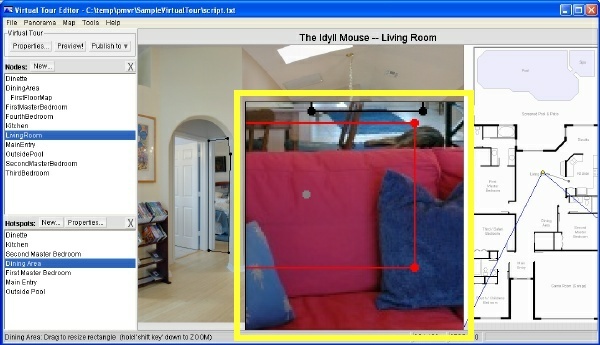 Use the 'Import..." button to add a map/floorplan image into the virtual tour project. You can add as many maps as you want to a virtual tour. Most often, several panoramas share a map/floorplan node. The yellow dot in the floorplan represents the panorama camera position. Click and drag to move the position. The blue lines represent the current 'field of view' of the panorama. The width of the panorama viewer window determines the angle of these lines. However, you must point them in the correct direction, which is the reason for the gray control point. Just click and drag to rotate as needed. TIP: Drag the panorama image until a corner of a room is leftmost (or rightmost) inside the viewer window. Then, click and drag on the gray turning dot until the left (or right) blue line on the map crosses the room corner (on the map). Please note that this will only work if you have first moved the yellow dot to the panorama picture taking position on the map. Active Node: First, select the node (panorama node or map node) from the nodes list that you want to add a hotspot to. The panorama (or map) will then appear in the left side of the Virtual Tour Editor, where hotspot editing takes place. TIP: Drag a polygon line 'mid point' to create a new polygon control point. To delete a polygon control point, drag it over an adjacent control point. TIP: To edit/change an existing hotspot, click on the spot (to change the focus to the hotspot), then right-click to obtain the hotspot context menu. When the PMVR viewer first diplays a panorama, in what direction does it present the panorama? That is what the 'center' indicator is for. To change the initial viewing direction for a panorama, click and drag the 'center'ing triangle that you see just below the panorama. When PMVR first displays a panorama, this triangle will automatically be centered within the viewer window. Another Way: The Virtual Tour Editor tries to work around any preview failures (due to personal firewalls, etc), so if the preview fails, just publish to the Duckware Trial Web Server (next section), or publish to a temp folder and open the index.html to preview your tour. Click on the 'Publish to' button to obtain publish options. The quickest way to see your virtual tour on a web server is to select the 'Duckware Trial Web Server' option. To automatically publish the tour to your web server, select the 'Web Server via FTP' option. TIP: To automatically customize the default index.html created by the Virtual Tour Editor, review how Templates work. TIP: To manually customize the index.html, take the index.html created by the Virtual Tour Editor and modify it to your look/feel needs. Then, when you publish the tour again, overwrite the index.html with your customized version. This generally work well only after you have defined all of the nodes in a tour. The index.html HTML file that this VirtualTourEditor produces can be fully edited and changed by you to create any look/feel that you want. And this method works well for 'one off' tours. Produce the tour, publish to a zip file, modify the index.html file, and provide the ZIP to your client. However, if you are going to be producing a lot of virtual tours with the same look/feel, you can add a template file into the tour editor.